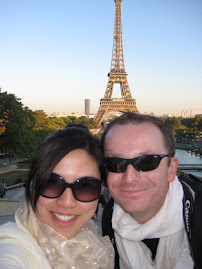 Because of my pregnancy, we are stuck here in Kuala Lumpur for the summer holidays instead of enjoying the beautiful landscapes of South of France. Now that my daughter is on her holiday break, I was racking my brains on what to do with her so that she can enjoy and learn something new since we have to stay in KL. 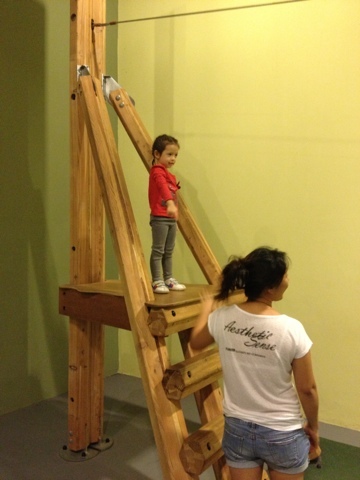 A friend suggested we check out Young Explorer in One Mont Kiara. I knew about it way back, however at that time my daughter was about 2.5 years old which was too young for such activities. Now that she is 3.5 years old, I think it's time to bring here there for an adventure. It proved to be good decision. It was hours of pure fun, starting off from 9:30am all the way to 1pm on a Wednesday. We saw the holiday camp schedule and picked out the Rocket Ship theme, since 2 of her school friends have signed up for the same day. When I inquired with the lady in charge, she said we could leave our kids in the morning (the holiday camp started at 9:30am). However, on the day itself, we (me and my friends who had their little girls attending the holiday camp) couldn't get ourselves to leave them. Why? Because they were the youngest in class, and because there we rough older boys involved in the holiday program. I was not confident with the number of teachers they have on hand as opposed to the number of students they accepted for the holiday camp. So, the three moms ended up staying from 9:30am to 1pm. Don't get me wrong. Despite the wrong expectations and surprises, we all had fun. 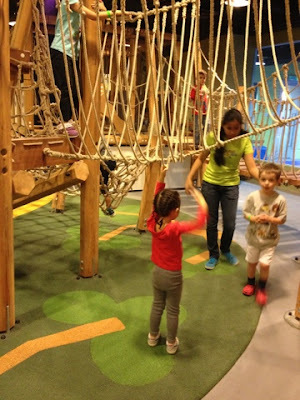 The adventure area where there are wooden planks and rope bridges provided lots of fun (and also heart-attack moments for us) as we thought our kids are too fragile for it. 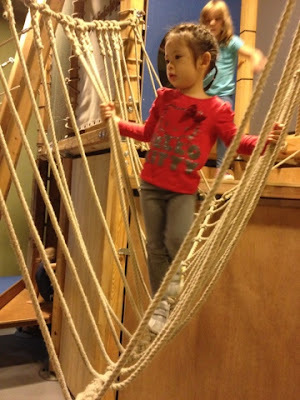 We were proven wrong as they climbed up and down, and my daughter even did the "flying fox" where she just held on to something and it zipped by. More info on their Adventure Maze HERE. For the adventure maze, the kids had to wear rubber shoes so they could run around safely in the wooden maze. They played for about an hour here and after a while in that area, I was bit more relieved. The only worry was falling off while they were climbing up. Again, with the number of students who signed up for holiday camp, plus they mixed all ages from 3 years old to 6 years old, we find that the number of staff was not sufficient. Hence, if you have a young daughter, I suggest you stay behind to supervise and look after her. 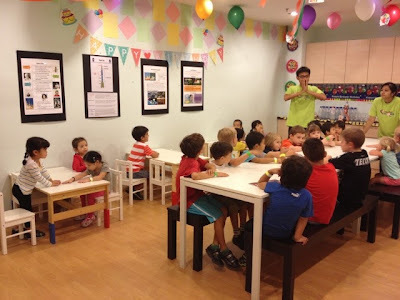 After the Adventure maze, they had classroom time where they explained to children about rocket ships. After which they built their own rockets. 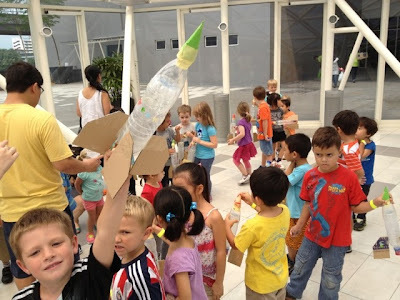 The classroom time was about 1.5 hours, so the moms went out for a short coffee break and when we came back, we found the kids on the outdoor area (at the top floor of One Mont Kiara) where they were launching off their rockets! That was a spectacle and they did have fun watching the rockets launch one by one. 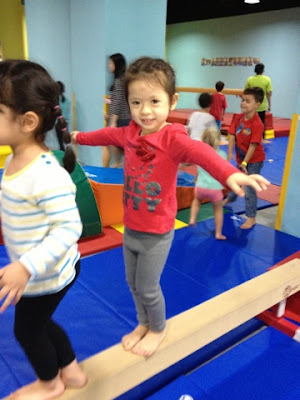 Last, they had fun running around, jumping and tumbling at the Gymnastics Gym area. They also inflated a rubber platform where the kids jumped around. They split the group into 2, and had some teachers helping to lead the activities. It was fun, my only fear was my little girl will be squished by the 6-year old naughty, active boy who was also part of her group. 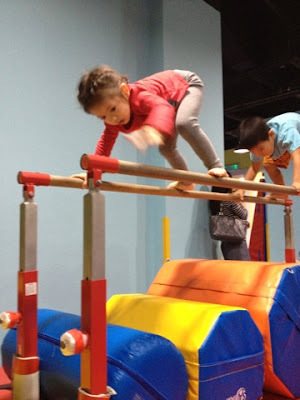 Apart from that, I think the Gymnastics Gym was fab! 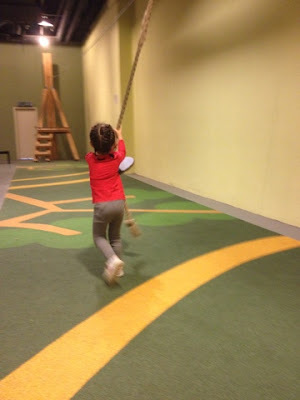 It reminded me of her Gymboree days, with the colorful surroundings and padded floors. 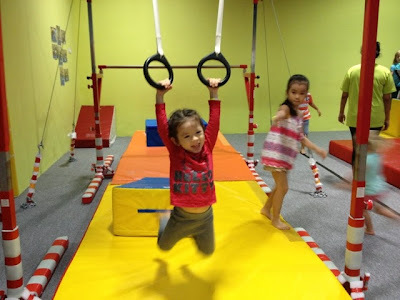 I paid RM95 for a one-day holiday camp. It was worth it! Gym time... my daughter loved it! Crossing the bar bridge -- my daughter was adventurous!